The Big Day was approaching, my friend was so buried in arrangements that she never thought about her hair until she looked at herself in her wedding gown for the first time. Then she started to have second thoughts about her short hair. She had always been this outgoing girl, fun to be with and her short hairdo expressed her personality and allowed her stunning smile to be seen at its best. A smile that was fading away, she looked at her dress and couldn't find a way to match it with the short hair. Her mother's advice was extensions, but long hair just wasn't her thing. My advice was to enhance her beautiful hair with creativity, some curls and coloring, whatever made her feel unique and walk down the aisle like a Queen. You may think that your short hair can't give you glamor and can't match a wedding gown that is magnificent and fills the room. Some people think that a short hair will be so simple that all attention will be focused on the wedding dress. Well, they are wrong. Even if there isn't much hair to work with, it is all about creativity, and for a wedding day, it's also about going the extra mile in everything you do. First of all, future brides should think of dress, make-up and hairdo as a whole. From the toes to the tip of the nose, everything has to match your personal style, make you feel comfortable and beautiful. Just like you try your wedding dress several times before your wedding day comes, you should try your hairdo in the same way. Go to your hairdresser and ask for your desired short hair style for the day. Use it during the weekend and see if it works. Do it before you try your wedding dress, see if everything falls in place. If you don't like the hair style, find ways to improve and recreate your dreamy short hair style. Add pearls, gems or flowers, these will give your hair shapes, volumes and dimensions. Don't overdo it and just don't let the hairdo take away all the attention from you. Try a faux updo, lift your short hair to enhance your face and your shoulders. Try waves, ask in your salon to wave your hair softly and create a sensual look. Try to add curls, they will instantly turn a flat hairdo into a glamorous one. Try messing up your hair a bit, it will give your short hair texture and a feeling of movement. 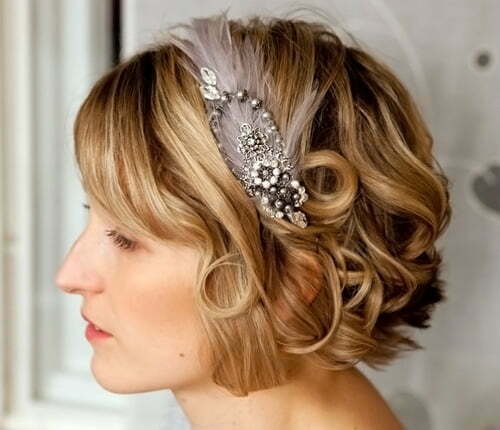 Try a sleek style, push it all far behind, use a jewel encrusted hair clip, barrette or comb, even a pearly headband. It is all about trying, trying again and then trying some more. Be creative, find ways, ask for advices from professionals, look for pictures of wedding hairdos. Remember short hairs from stars like Hale Berry and Sarah Jessica Parker? They all looked stunning on the red carpet showing off their short hair styles. And so can you, with friends and family members looking at you and with the lenses of the photographer capturing your dazzling look that will serve as reference style for future weddings.